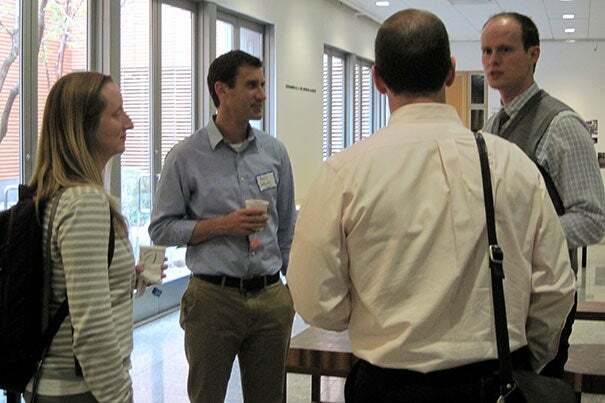 Education data scientists from Harvard’s Office of the Vice Provost for Advances in Learning (VPAL) hosted dozens of their peers from colleges and universities across the country late last month to discuss emerging challenges in research and design of digital higher education programs. Digital learning produced at Harvard has had a far-reaching impact, both globally and on campus. Since the inception of the edX learning platform in 2012 as a nonprofit joint collaboration by Harvard and Massachusetts Institute of Technology (MIT), millions of learners at universities and institutions here and abroad have taken courses on the platform. HarvardX, a University-wide initiative that creates massive open online courses (MOOCs), has itself created more than 100 courses on the platform. HarvardX has also worked to identify opportunities to leverage its online learning content in Harvard’s on-campus classes, and has helped create more than 20 blended courses at the University using HarvardX materials. The recent beta launch of the new HarvardDART (Digital Assets for Reuse in Teaching) tool will support this important goal by offering instant access to HarvardX content and the ability to embed individual learning assets — including videos, assessments, or text pages — more easily in Harvard classrooms this fall. Institutions attending VPAL Research’s “Emerging Challenges” conference gathered to discuss the power of the digital space in higher education and identify roadblocks each has faced in supporting research and program development. The group worked to synthesize areas of common challenges, and set the stage for ongoing discussion, collaboration, and development of solutions beneficial to all participants. The conference included attendees from edX, Arizona State University, Carnegie Mellon University, Davidson College, Haverford College, the Korea Advanced Institute of Science and Technology, New York University, Stanford University, the University of British Columbia, the University of California at Berkeley, the University of Chicago, the University of Michigan, University of Wisconsin at Milwaukee, and the Worcester Polytechnic Institute, as well as Harvard, MIT, and education companies such as Kaplan. As digital resources have become more integrated within higher education programs, colleges and universities have seen the value of developing in-house organizations to guide the institution’s path on education innovation. However, there is no blueprint for creating such an entity on campus or deciding what its main focus should be (research and development, online education and MOOC development, pedagogical innovation, etc.). Conference participants — some of whose institutions have already created education innovation offices — agreed that gathering and discussing best practices could identify a number of digital higher education strategies and solutions. However, even with a guide, designing an innovative higher education plan can be daunting. During lively and collegial conversations, participants shared their experiences around a number of key themes through short presentations and panel discussions focused on the design of digital education interventions and experiments, advanced assessment, and learner credentialing. During the session on experiments and intervention, an emerging theme involved developing systems that better connect participant data. Effectively understanding how participants are learning is critical to designing interventions and structured course improvements that can help future learners achieve desired outcomes. Ido Roll of the University of British Columbia emphasized the importance of bridging the gap between course design and research in digital learning environments. Another common difficulty faced by conference attendees in their roles as digital course developers and researchers involves the development of innovative courses that meet diverse student needs and objectives without compromising educational quality or depth. Ongoing MOOC research has shown the pool of online learners contains a wide range of ages, cultures, locations, and educational backgrounds. During a session on credentialing, Isaac Chuang, senior associate dean of digital learning and professor of electrical engineering and computer science and professor of physics at MIT, provided an overview on the evolution of MOOCs around digital content and credentialing. Citing a recent report examining four years of HarvardX and MITx MOOCs that he co-authored with Andrew Ho, chair of the VPAL Research committee and Harvard professor of education, Chuang detailed how online course content is diversifying and credentialing mechanisms are changing. A significant challenge that elicited a protracted discussion concerned managing the value, both perceived and actual, of MOOC certification for learners’ professional and socio-economic growth. MOOCs allow anyone with an internet connection to enroll, providing great access to higher education — but they lack “exclusivity” (as in not being part of a carefully curated cohort, selected through a competitive admission process), which some participants thought could threaten the perceived value of course certification. However, attendees agreed that open access to high-quality education creates measurable impact in and of itself. Conference participants concurred not only on many common challenges they face developing online learning programs at their home institutions, but also on the need for continued collaboration in tackling them. Late arrival Dean Rakesh Khurana (from left) greets Harvard President Drew Faust and the Rev. Professor Jonathan Walton as they lead graduating seniors through Harvard Yard to the Baccalaureate Service in the Memorial Church.